This great picture is courtesy of Murty Campbell. These pages follow on from Organizing A Day Trip. Have a look at Song Of The Paddle: An Illustrated Guide to Wilderness Camping (Northword Press, 1988) by the Canadian canoeist, naturalist, author and film-maker Bill Mason. What are the ten crucial things for a happy expedition? Here's Freya Stark's personal list from A Winter In Arabia : "First of all, a temper as serene at the end as the beginning of the day. Then ... the capacity to accept values and to judge by standards other than our own. The rapid judgement of character; and a love of nature which must include human nature also. The power to dissociate oneself from one's own bodily sensations. A knowledge of the local history and language. A leisurely and uncensorious mind. A tolerable constitution and the capacity to eat and sleep at any moment. And lastly, and especially here, a ready quickness in repartee." I'd expedition with her any time, except that she'd be 120 years old. Camping away from organized campgrounds is still easy in most of the world. Over in Europe there are still plenty of nice wild camping spots in Scandinavia and Scotland, and even in England, Wales, Brittany and the Mediterranean if you know where to look and have a small tent in a camouflage color. With wild camping there's no toilet, hot shower, electricity for shaver or hair dryer, no store, the surface is not leveled and the grass is not cut short. It's up to you to find a site which is horizontal, grassy, and soft but not damp. And ideally out of sight of houses and roads, near a small fast-flowing stream, not shared with horses, cattle or goats, and that gets evening sun. A sheltered site if the weather's cold and windy, a site exposed to the maximum wind if it's the season for biting insects. Pace every inch of your chosen tent site to see if there are rocks or hollows. With a good tent you can camp on sand if you have to. On sand, you can't anchor your guy-ropes to tent pegs but you can fill a few bags with sand, or bury a few sticks in the sand, and tie your guy ropes to them. Or turn your kayak upside down and tie them to it. You may find that a lot of little hopping insects want to share your tent. The coastal environment is more fragile than it looks. For practical advice, and codes of conduct for particular areas, see Protecting The Environment and in particular Leave No Trace Ethics. There are likely to be rules about where, when and how you can camp within a national park or wildlife sanctuary. The most convenient ways of camping with your kayak are to put your tent up within walking distance of your vehicle, or just sleep in your vehicle. A minivan is perfect for weekends away. 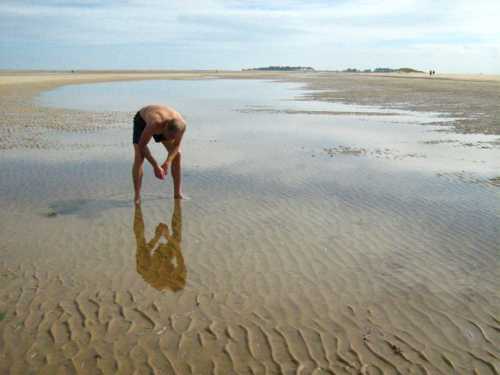 Set off straight from work, go to sleep near the sea, don't worry if the ground is rocky or mud. Make a quick getaway if the landowner or park ranger turns up at 7 a.m. And a minivan is not too high to fit under the height barriers installed at some parking lots to exclude RVs. It's not as romantic as kayak-camping but it lets you enjoy using a light, responsive kayak during the day, stay clean and eat fresh food. Daily access to a vehicle means you can eat fresh bread, meat and vegetables, have enough clean water to drink and wash, and put on clean, dry clothes when you get off the water. Also, you can have a fire on the beach without melting lots of little holes in your Gore-Tex kayaking equipment. 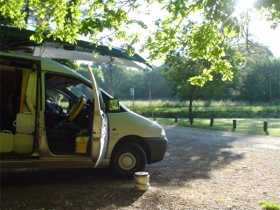 When you get back from kayaking you can wash properly with warm water, dry off with a big towel and put on dry clothes. Warm water? 50 cl sports drink bottles, with the sort of cap which produces a thin jet of water when you squeeze the bottle, are great for camping away from official campgrounds. If you have to wash in the open air, it's amazing how much less water you need to splash onto your shivering body if you can squirt a jet of water just where you need it. If you re-fill three or four bottles with water and leave them on your vehicle's dashboard and they will warm up during a summer day, or in cold weather they will warm up very effectively if you drive for 20 minutes with the vehicle heater on. And if your vehicle has a bed, it doesn't matter if there is a day when the wind is howling and rain is lashing down. You have a cozy place to read, doze and listen to music. A deserted beach, an unspoilt area, silence except for waves and bird calls, fabulous sunsets. Kayak camping can be a magical experience anyplace from Thailand to Greenland. 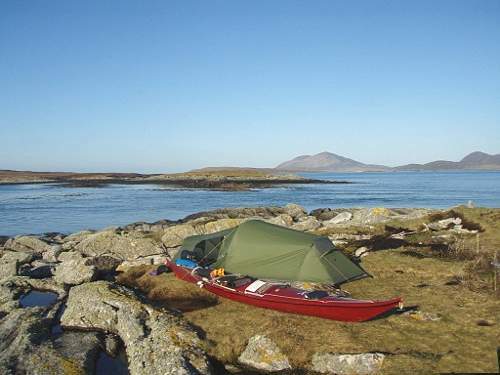 Change campsite every day, or kayak to some perfect island site, set up a base camp and explore from there? 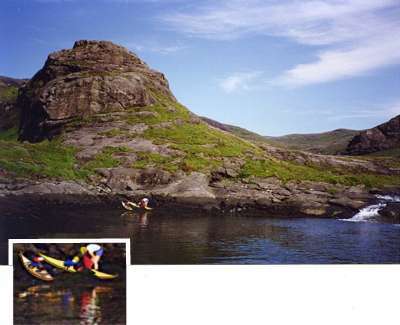 The former is more romantic, the latter means you have the pleasure of exploring in unladen kayaks. The "base camp" approach can be good in wet weather when moving camp a lot means you put a wet tent and a damp sleeping bag into your kayak every morning, and take it out even damper every afternoon. Paddling a laden kayak for long hours every day can eventually give you bruised palms and tenosynovitis. Then again, Keith lives in Wales (not a notoriously dry part of the world) and says "with the right kit and technique I find it straightforward to stay warm, dry and clean in the foulest weather" and he comments that his expedition kayak is "great to paddle fully laden - very stable and easy to keep up to speed. Handles rough water much better than when empty too." • Tent. Ideally a dome tent or tunnel tent consisting of a waterproof flysheet with bell ends, and a separate inner tent with panels of mosquito net and a sewn-in groundsheet which extends 4 inches up the sides. The flysheet keeps the rain off the inner tent and you can store all your spare equipment under the ends. Camping in some areas is permitted only if the tent is very small, and dark green in color. For real wilderness areas there is something to be said for yellow or orange tents - they're a lot more cheerful inside if you spend a rainy day in your sleeping bag, reading. Some cheap supermarket tents are surprisingly good. Tents made of cotton canvas are comfortable for base camp but very heavy and bulky so they are not suitable for kayak camping. Gore-Tex bivouac sacs have neither pegs nor poles so they are very discreet and compact, and can be got cheaply from a military surplus store. Bivi bags are OK for sleeping, but they offer no comfort if you are awake and it is misty or raining. Some kayakers take a sheet of thick polythene sheet the same size as the inner tent, and put it on the ground to prevent sharp vegetation puncturing the tent's groundsheet. • Sleeping pad. Camping mattresses made of closed-cell foam are cheap, tough, comfortable and don't get punctures but a full-length one is too big to fit through a kayak's deck hatches. They can be carried in a roll on the rear deck. A self-inflating sleeping pad such as a Thermarest will fit into the kayak through a hatch. • Sleeping bag with synthetic filling. Bags filled with duck down or goose down are wonderfully light and compact but very expensive, and if they get wet they have about the same bulk and warmth as a Pepsi-Cola can. Synthetic bags are quite heavy and bulky but they are good value and give good insulation even when wet. They usually have an outer layer of ripstop nylon and an inner lining of a polyester-cotton, filled with the same stuff as a good domestic quilt. In other words, polyester quilting. Trade names include Hollofil, Qualofil, Primaloft, Spirafil or Polarloft. There are different grades of filling. The better ones have springy hollow threads. They last longer, expand to be thicker and compress to be smaller than the cheap ones. For most sea kayakers in a cool climate, the best solution is a warm cocoon (mummy-shaped) bag with a full-length double-ended zipper, carefully made so that the polyester batts overlap like shingles on a roof. Manufacturer's ratings for sleeping bags assume that the user is used to cold conditions and will wear warm clothing in bed. We find that a sea kayak trip in Scotland in summer demands a bag rated at least "three seasons" or "down to 5°C". In cold weather, the cocoon shape lets you pull the draw-cord and bring a hood up around your head so that only your nose is left sticking out. In hot weather, you can open the zipper at the bottom and let fresh air get to your lower legs. Couples can get matching bags, one with a right-hand zipper and one with a left-hand zipper so they can be joined together. This means not only added romance but an extra 5 degrees of warmth on a chilly night. When a sleeping bag is rolled up in its "stuff sack" it probably won't fit through the kayak's hatches. Many people take a medium-sized dry-bag and put the empty bag into the kayak through the deck hatch. Then they stuff the sleeping bag into the drybag, roll up the neck of the drybag and seal it before putting on the lid of the hatch. • Wash bag containing toothbrush, small bar of soap, hand towel, empty 50 cl sports drink bottle, small container of shampoo. If you take a large bottle of shampoo it will inevitably leak over everything else. Camping stores sell sets of little plastic bottles into which you can pour as much shampoo and washing-up liquid as you will need for the trip. See Retail Outlets. • Something to sit on in the evenings. A square of 3/8" foam sleeping pad or a folding camping chair with legs (for summer in the Arctic). • Cooking equipment and good food. There's no need to be hungry or depressed. See Kayak Camp Cooking. • Lavatory equipment. Plastic bag, suitable toilet paper, maybe a trowel. See Leave No Trace Ethics. • Water container(s). It is nice to have 5 gallons stored by the tent, and a 1-pint bottle for use when you're cooking or washing. It's not easy to find a bulk container that doesn't make water taste of plastic. • Water filter and pre-filter, unless you can expect to have access to a faucet or a clear, clean stream. See Water & Food. • Insect equipment. Everywhere in the world, something will be after your blood. Insects get more determined the closer you get to the tropics and the sub-Arctic. In decreasing order of size: Horse flies, mosquitoes, blackfly, sandflies, midges / no-see-ums. If the local problem insect is tiny, it will fly right through the large mesh of a tropical mosquito net. and because biting insects love ankles, some long socks too thick for an insect to bite through. Sub-Arctic biting insects particularly like warm humid weather and may come out in large numbers after rain. The Maine black fly is a nuisance mainly from May to early July, the Scottish midge mainly from July to early September. If they get really troublesome you can escape by camping in a windy location, sitting on bare, rocky terrain, walking out along a pier so that you are nearly surrounded by water, or lighting a smoky fire. A few days or even weeks of the year can be pretty grim. In an extreme case you may need a midge veil to go over your hat and tuck into your shirt collar, thin cotton gloves, and fly-screen for the windows of your vehicle so you can retreat there if things get desperate. • Binoculars, to watch wildlife without disturbing it. For walking and kayaking we love Acuter's little 8 x 21 or 8 x 25 roof-prism binoculars, because they have reasonable performance, are light (from about 300 gm), fit easily into a pocket and are so amazingly cheap that it hardly matters they are neither waterproof nor nitrogen-filled. If binoculars are filled with nitrogen, no water can get into the optics but if you get salt water on the body or mechanism they may corrode. The first number in 8 x 21 refers to the magnification and means that the image is eight times larger. The second number is the diameter in millimeters of the objective lens. This is the lens furthest away from your eye, and the larger it is the better the binoculars will perform when there is not much light. However a large objective lens also means that the binoculars will be heavy and expensive. • Traction kite to pull your rafted kayaks downwind. See Sailing A Kayak.